Drawstring Bag with tassels and matching Stole, about 60" x 18" (150 x 45 cm). Needles: #8 US (5 mm) for bag and #10 US (6 mm) for Stole. 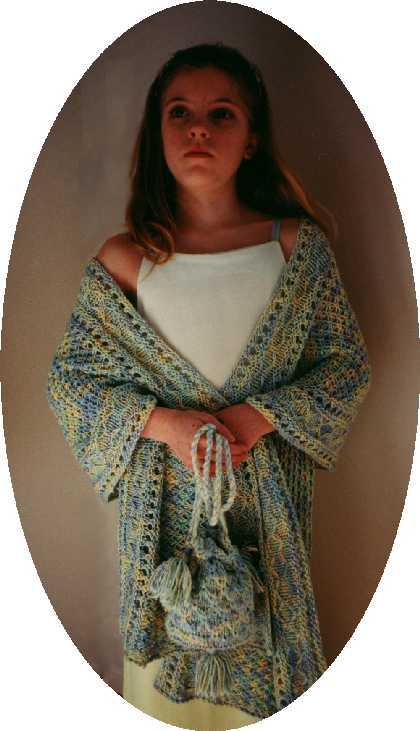 Shawl is shown in Lorna's Laces Lion and Lamb (color Green Valley). It has been discovered that some pre-release copies of this pattern were distributed in error. On page 3, in the eighth line of the Stole instructions, it reads: "Work ____ repeats of Lace Background Stitch." It should read "Work 8 repeats of Lace Background Stitch." Please accept my apologies for any problems this may have caused.